William Robert attended the Church Street Schools. Although it is not known what occupation he followed, it is known that he was a member of both the 17th Company Boys Brigade and later the Old Boys. William Robert Jackson was conscripted in the army at the age of 20 in 1917 and was posted to 2nd /5th Battalion Lincolnshire Regiment. This battalion was a second line territorial battalion which had been formed at Scarborough in 1915. Early in 1915 the battalion was in Benton Newcastle where it became part of the 189th Brigade 63rd Division, in July the Division was in Cramlington and in November 1915 was training in Gainsborough, Linconshire. This division was later disbanded and the battalion became part of the 220th Brigade 73rd Division while at Blackpool on November 9th 1916. After training as a signaller Private William Robert Jackson was sent with a draft to the front to replace the losses in the battalion. 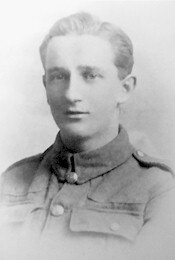 Like another former member of the "Old Boys", Percy Bettle, he went missing, believed killed in action on that fateful Thursday in March 1918 during the first day of the German Spring Offence. Mr & Mrs. John Jackson of 84 High Road, Beeston have this week been officially informed that their son, Signaller W R Jackson of the 2nd/5th, who was reported missing as far back as 21st March 1918 must now be recorded as having been killed on that date. (His brother,) Lance Corporal Edward Elston Jackson went through the whole campaign having been mobilized with the Robin Hoods at the outbreak of the War. This gallant soldier has seen some hard fighting including the "Battle of Hill 60" in Belgium where he was badly wounded; after that he spent some twelve months in hospital in England. On recovering he was sent back to France and later served in Italy with the 11th Battalion and later returned to France after again being wounded. The twenty three year old was single and had previously worked for Mr C Sibley in the painting business. Arras Memorial - The Arras Memorial is in the Faubourg-d’Amiens Cemetery which is in the Boulevard du General de Gaulle in the western part of the town of Arras. The cemetery is near the Citadel, approximately 2 kilometres west of the railway station. The Faubourg-d’Amiens Cemetery was begun in March 1916. It continued to be in use by field ambulances and fighting units until November 1918. After the Armistice the cemetery was enlarged when graves were brought in from the surrounding battlefields and from two smaller cemeteries in the vicinity. The cemetery contains 2,651 burials from the First World War. The Arras Memorial commemorates almost 35,000 soldiers from the United Kingdom, South Africa and New Zealand who died in the Arras sector between the spring of 1916 and 7th August 1918 and have no known grave. 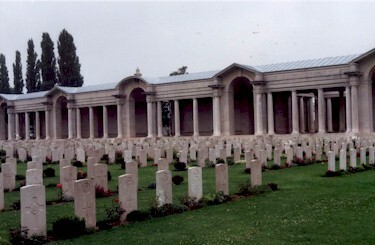 The most conspicuous events of this period were the Arras offensive of April-May 1917, and the German attack in the spring of 1918.The cemetery also contains the Flying Services Memorial which commemorates nearly 1,000 airmen of the Royal Naval Air Service, the Royal Flying Corps, and the Royal Air Force, either by attachment from other arms of the forces of the Commonwealth or by original enlistment, who were killed on the whole Western Front and who have no known grave. Both cemetery and memorial were designed by Sir Edwin Lutyens. The design consists of a cloister built up on Doric columns and faces west. In the broader part of the site the colonnade returns to form a recessed and open court, terminated by an apse in front of which is the Arras Flying Services Memorial. The names of casualties are carved on stone panels which are fixed to the cloister walls. And who have no known grave.